This year marks the 50th Anniversary of the first commercial recording by an Australian Bluegrass band. The Hawking Brothers with the Green Willow Boys, recorded 4 titles in bluegrass style for the W&G label in Melbourne in 1965. 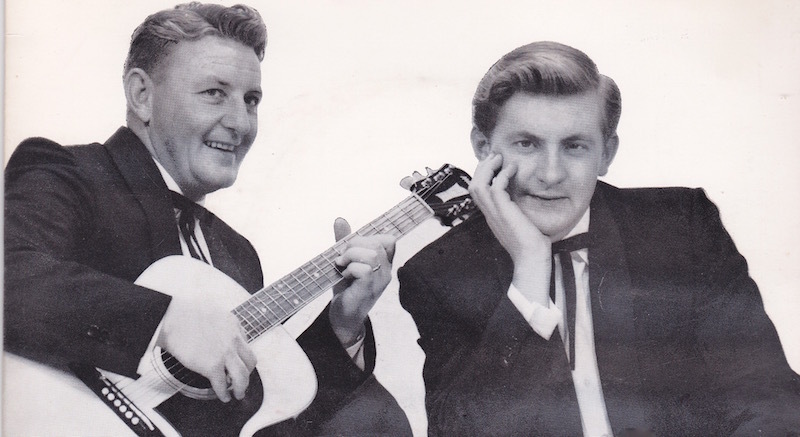 This EP, entitled Blue Grass Down Under, included the instrumental “Uncle’s Weeping Willow”, and the song “Don’t Leave Your Home Town Mister”, written by Alan and Russ Hawking. The historic recording featured Alan Hawking on banjo, Russ Hawking on resonator guitar and guitar, George Mack on mandolin, fiddler Jack Johnson, and Don McFarlane on bass. Russ Hawking and Barry Ling shared the lead vocals. The Hawking Brothers, along with George Mack and Jack Johnson, were part of the well-known Trailblazers band at that time. Alan and Russ were very keen to produce a bluegrass record. They organised rehearsals with the other musicians. Russ told some members of the Trailblazers that “we should play bluegrass – it seems that is the way to go”. All the players were very enthusiastic, and these rehearsals were taken seriously. In 1965 a recording session was arranged at the W&G studios in West Melbourne, and all four items taped at the single session. The cover photograph for the album was taken at Yarra Bend, and most of the instruments used on the recording are included in the photograph. These included George’s Gibson A40 mandolin, Alan’s Maton flat top guitar and Stewart 5-string banjo, and the National Silver steel guitar played by Russ Hawking. Virtually no promotion was undertaken by W&G or the group to sell the records. In fact, it was quite difficult to locate copies for sale during the time they were in the catalogue. The group only played together as a band for these recordings, and at several university campus engagements. Later in 1965, another Melbourne bluegrass band, The Hayes Brothers and the Bluegrass Ramblers recorded an EP also on the W&G label. The Hawking Brothers with the Green Willow Boys recorded a second EP in 1966, again in the W&G studios. Of the five items issued, two were in the bluegrass style. The participants certainly didn’t realize that they were part of a small but important page in the history of Australian country music. George Mack, now 81 years old, still enjoys playing the same Gibson A40 mandolin and often attends bluegrass festivals in Victoria to pick a few tunes and catch up with his many music friends. The years have flown since we recorded these Bluegrass tracks. I really am honored to have backed Russ and Alan on mandolin for the first commercial Bluegrass record in Australia. George Mack. Thanks George, we are all pleased that you did I am sure.